If one was making a list of ingredients to put in the rock ‘n’ roll stew, get your pen handy because another one is about to be checked off as it’s added to the pot. The saxophone had been an integral part of the jazz scene dating back to the mid-1930’s, following the lead of trailblazers like Sidney Bechet who gave the neglected instrument more cachet in its early years, and with the rise of swing it became one of the featured instruments in most groups. The trumpet, which had dominated jazz in the 20’s, was still going strong but the saxophone added a bit more muscle to the arrangements (see Ben Webster’s work with Duke Ellington for starters), as well as providing a very melodic component (thanks to Benny Carter and Coleman Hawkins), sometimes introducing an almost sensual mood to a band (notably Johnny Hodges), and with someone like Lester Young a sense of utter adventurism. Its popularity really took off when vibraphonist Lionel Hampton began spotlighting the instrument in his group with the likes of Arnett Cobb and Illinois Jacquet, two Texas-bred horn players who gave rise to the “honking” style of the tenor sax which would come to be most identified in their musical mutant off-spring, rock ‘n’ roll. The saxophone’s meteoric rise from a borderline novelty instrument in the twenties jazz scene to the star attraction in the mid-40’s jazz and swing movements meant it still had a rather malleable image in the public’s mind though. Was its rather sudden popularity a short-lived gimmick or a brilliant new innovation? Well the answer to that probably depends on just who you were asking. The mainstream pop offerings of the day – the records that were most widely heard on radio, played on jukeboxes, performed on bandstands and bought on disc – hardly featured the instrument at all. The likes of Bing Crosby, Frank Sinatra, The Andrews Sisters and Perry Como employed string sections as their primary instrumental sweetening as they wracked up hit after hit. When horns were used in pop music the trumpet was still the focal point in most arrangements, not the sax, with Harry James emblematic of the type of ensemble that was most popular at the time. You were even more likely to hear a cornet solo than a tenor sax solo actually, and if the saxophone was employed it was either fairly anonymously as part of a larger brass section or, more often than not, used as almost a humorous interjection – a novelty in other words… the exact same thinking it had been saddled with back in the 20’s. Thus by confining your listening to Your Hit Parade you’d probably come to the conclusion that absolutely no progress had been made over the previous twenty years or so when it came to the saxophone’s image. But if you turned your dial, or went to a different – more exciting (read: black) – part of town, the sax was definitely making waves. Bop was coming into its own and one of the rulers of that particular roost was Charlie Parker, widely considered among the most gifted musicians of the 20th Century, whose instrument of choice was the alto sax which he played with a beguiling mixture of melodic inventiveness and technical virtuosity. Yet bop was a somewhat non-commercial music by design, at least for the majority of the milquetoast middle-class, and of course not exactly ideal for the two to three minute hit single. To find it being utilized in a more accessible mainstream black style you needed to look to the jump-blues sides Louis Jordan and those who followed his lead were laying down which employed the instrument pretty regularly to good effect on the records that dominated the race charts for much of the 1940’s. Though it tended to be only one element of a larger ensemble in most cases, its presence was fairly steady and thus in that community its sound was more than welcome. But while there was presumably no crystal ball to tell these things at the time, all of those forms, swing, bop and jump-blues alike, while remaining popular with certain segments of the audience for some time to follow, were about to see their time at the head of the music class coming to an end. So if you’d received a tip as to the latter bit of information mid-way through 1947 and you were to assess the instrument’s standing going forward (its “futures” in stock market terms) you’d probably be inclined to sell, or at the very least not invest heavily in it anytime soon. Rock ‘n’ roll changed all that almost overnight, placing the saxophone front and center in its audacious bid to take over the music world. Paul Williams role in rock’s evolution is woefully underrated. Born in Tennessee in 1915 and reared in Kentucky as a child, he moved to Detroit in his early teens where he began his professional music career while still in high school, playing clubs, gigging with some bands, eventually joining King Porter’s group where his flamboyant stage style with the saxophone planted the seeds of the revolution in his future. After accompanying Porter on some sides earlier in 1947 Williams broke off and formed his own group and signed with Savoy Records that same year. On September 5th Williams cut his first records as a bandleader in his hometown of Detroit (the song is named after the heart of Detroit’s “Black Bottom” section of town, home of many of the hottest nightclubs the city had to offer ) and in the process lit the fuse for a potent new form of musical dynamite. It should come as no surprise, as we saw already with Roy Brown and will see again with a litany of others in the very near future, that it’s usually the novices, the guys with blank canvases and therefore nothing to lose who most often chart new directions in music. Either they’re ambitious enough to want to establish themselves in the most notable way possible right out of the gate, or they’re dissatisfied with what currently exists and always felt if they got their chance they’d do something different, but whatever the reason more often than not the new artists that come along who are the ones to change the ground rules. Though Williams was older than most fitting that role he too had no track record to feel beholden to and thus could do as he pleased stylistically in order to make his name. He did just that too as his debut became the first rock instrumental release, establishing the style which would remain a strong presence in rock for much of the next thirty years or so. With a long siren call opening to announce their presence, the band quickly falls in behind with T.J. Fowler’s piano setting the crucial rhythmic drive as the horns churn in unison over the top. Williams first solo takes off like a fighter plane off the deck of a carrier, soaring into the pale blue skies, circling with elation, soaring higher and diving lower as its then joined by the rest of the horn playing squadron led by tenor Walter Scott and trumpeter John Lawson. Like many future sax instrumentals it’s not the tightly structured melodic attributes that define Hastings Street Bounce, but rather the freewheeling sense of adventure. They’re skilled enough to remain within sight of one another, all heading in the same basic direction, never crossing paths and sending another into a tailspin, but they never stay in a tight formation either, choosing instead to show off a bit, with Williams getting more and more unhinged as they go along. The first minute of the record delivers more of a solid groove, if not quite an enthralling one. You enjoy it enough while it lasts without ever getting locked into a trance. The final minute and a half is more shambolic, each one going off on their own, trying their best to build up excitement but they seem a bit unsure of how to make it truly scorching. The horns all remain in the mid-upper range of the instrument which means there’s not enough tonal contrast and as a result it begins to all blur together. No deep honks or ear-piercing squeals to startle you, no returning to that initial groove to keep you riveted. The overall intent is right, they’re emphasizing many of the components that will soon define the style yet they haven’t fully hit on the precise formula to make it compelling. It’s a step in the right direction though and their willingness to abandon proper musical decorum was what ultimately set the course that everybody else soon followed. To the uninitiated at the time it probably seemed a bit garish, a somewhat ostentatious display of musical recklessness if anything, but then again for those weaned on a more orderly sense of playing that type of reaction is to be expected. These guys were charting new territory and for those still fixed to the ground it had to appear as if they’d flipped their lids a little bit. There was no assurances that anyone would be interested in this, but THEY, the artists themselves, were interested and soon others had their curiosity piqued by what could be explored beyond the vista. New barriers were being broken with alarming regularity in 1947 America, and as this record was released an Air Force test pilot named Chuck Yeager became the first man to break the sound barrier when he flew an experimental aircraft past Mach I on October 14th. It marked the dawn of the jet age and corresponded with the arrival of the rock age. The line dividing yesterday with tomorrow was growing ever wider. In the end Williams and company don’t really go anyplace here, nor did Yeager for that matter, but they hadn’t intended to either. It wasn’t so much the destination that mattered in either case as much as the means with which to simply GO. Williams and company were simply up there among the clouds on recreational maneuvers, sightseeing if you will, looking down at the specks below and glad they weren’t bound by gravity anymore. When they came back down to earth, a bit dizzy maybe, light-headed and with sloppy grins plastered on their faces, they were sure to get bawled out by a commanding officer for their antics but back in the barracks they’d be asked repeatedly to describe how it felt up there by their envious fellow pilots… err, horn players. In time more of them would take off themselves, a few would crash and burn but more and more would soon go over the horizon to see what was out there too. This hadn’t quite gotten that far yet, after all, rock ‘n’ roll was barely a month old at this point, but they were on their way. Though this didn’t make the Billboard charts, which then and now were considered the barometer of success, it did make Cash Box’s regional charts in both New York and Chicago which gave immediate notice that the honking school of rock instrumentals had commercial potency. Savoy’s own ads for the record proclaimed “It’s different – It’s mad.. it bounces… and Rocks! and reiterated it in another by claiming “That bouncing beat that rocks the house!”, further establishing the sax-led instrumental as the engine which would carry rock ‘n’ roll into the future and Williams was the pioneer in that regard. As for Hastings Street itself… its heyday lasted until the late 50’s when in the name of urban renewal the bustling street saw its buildings demolished, its residents packed off to the newly built Brewster Housing Projects (where the future Supremes and Miracles that would lead Detroit’s next musical revolution came of age) and a cold impersonal highway was laid down where Hastings Street had once jumped with musical passion. The timing of this pretty much coincided with the decline of the saxophone as rock’s primary soloing instrument as the two went off into the sunset hand in hand after all. But while it lasted it sure was fun and as a first step in that journey this will more than suffice. 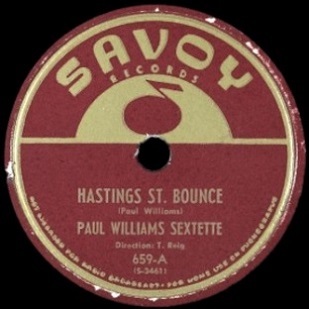 Leave a reply on "Paul Williams: “Hastings Street Bounce”"